As someone who was born in Vancouver, I have fond memories of White Spot… especially their pirate paks. As I got older, I started to appreciate their legendary burgers and other casual dishes like chicken pot pie and fish and chips. However, over the last 15 years or so, I’ve noticed a decline in their food. Nothing too serious but noticeable enough that I often lament about how their coleslaw used to taste better or their hamburgers used to be juicier. Nowadays, I don’t really pay attention when a new White Spot location opens up. For instance, the White Spot that’s located in the old Ikea parking lot on Bridgeport Road in Richmond has been open for over a year (I pass by it whenever I head into Richmond to grab some LA Chicken) and I’ve never visited until this past February when we showed up for breakfast. 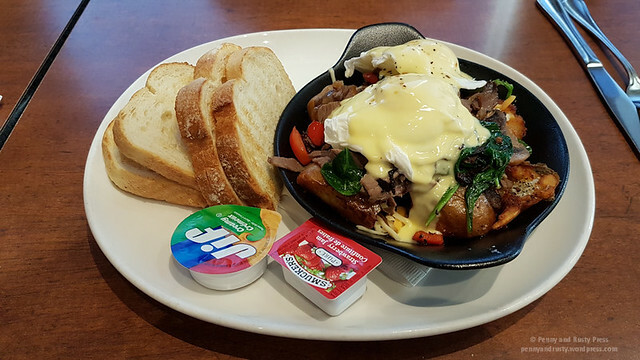 The Cheesesteak Hash ($14.99) was prepared with sautéed spinach, red pepper, mushrooms and shaved beef over their smashbrown potatoes. This wasn’t too bad but I think I got hooked up on the name of this dish because I don’t think they should have called it a “hash” while using their smashbrown potatoes. I’m not much of a smashbrowns fan as I feel like it’s the lazy way to do things and you don’t get any crispness to the potatoes. I also would have preferred if they included grilled onions with the cheesesteak… just saying. 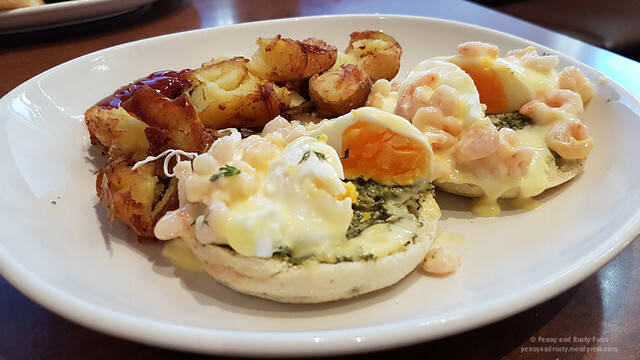 For the real fiasco, I had the Shrimp Florentine Benedict ($13.99). When you hear this, you think of something elegant and beautiful. They say it’s supposed to come with creamy spinach and artichoke hearts, baby shrimp, and fresh dill. Let me just say that I’ve had breakfast at a White Spot in Maple Ridge 2 years ago that used fresh dill and it was really good. This time around, I couldn’t even smell the dill on this plate. The real problem with this dish is what they did to those poor eggs. Just look at those dry, over-cooked egg yolks! If that wasn’t enough, the spinach and artichoke was also dry and bland. Oh, and more of those accursed smashbrown potatoes. Service was a bit slow considering how slow it was in the morning. White Spot can seriously do better. 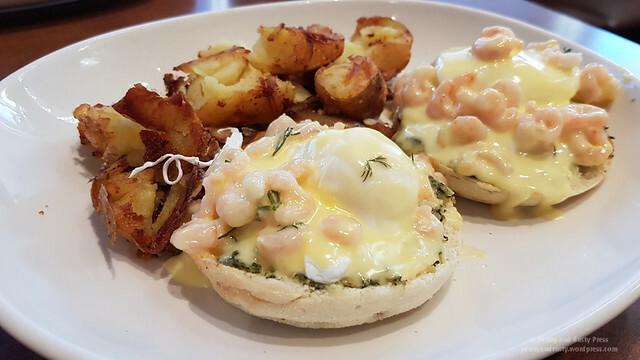 Posted on June 28, 2018, in Breakfast, Casual - burgers and stuff, Restaurant Review and tagged Breakfast, Central Richmond, Cheesesteak Hash, Food, Overcooked Eggs, restaurant review, Richmond, Shrimp Florentine Benedict. Bookmark the permalink. Leave a comment.